A Frugal Meal - PizzaEliminate The Muda! Two months of work, all wiped out in a matter of minutes. All it took was one delightful bite of the best pizza I have ever eaten! It was nearly a year ago when I first heard of the crazy pizza dude. I was visiting my brother. We were talking homemade bread when he mentioned this blogger that was psycho about making the perfect pizza. The guy had to be crazy; he had overridden the safety devices on his kitchen stove so that he could cook at extreme, oven cleaning, kind of temperatures. It was an interesting story but I was into making the perfect bread and never checked the story out further. Then last December I burned a couple weeks of vacation and spent my time having a frugal staycation. A lot of time was dedicated to the ongoing bread making efforts, but I also decided to experiment. Inspired by a random comment from Craig at MoneyHelpforChristians we took a basic dough recipe and applied my usual chaotic charm and “a few” added seasonings. For a little more than $2.00 per person we had a better than most delivery pizzas pizza! With all due respect to the hard working delivery dudes, I knew that I would not be ordering a pizza again. Our first effort was surprisingly good. Not just because it is amazing that anything I cook is edible, this pizza , the crust and the flavor, were all decent. Admittedly not great, but better than anything from our local chain restaurants. This post was featured in the Money Hacks Carnival hosted by Yes, I am Cheap. Please check out this blog for many other great personal finance articles! That quickly I had forgotten the bread and was now focused on improving the pizza. For the cost of one delivery pizza I had a baking stone and new pizza peel (the big wooden spatula) ready for cooking. Since the holidays, I have made over a dozen pizzas. Each time the dough is a little better, the pizza a little tastier. Last week on a business trip in I met another pizza making hobbyist. Over a business lunch we swapped tips, recipes and war stories about crusts gone wrong. And then he too talked about some crazy guy making pizza in a jury rigged oven! Two different people, in two different states both inspired by the same lunatic? I had to see it. When I found and reviewed the crazy guys website, I was impressed. This was not average DIY’er trying to save a dime, this was a hard-core pizza loving genius. But wait, there is more… crazy guy has taken his pizza public! He has a restaurant in Atlanta. Lucky me just happened to be two days away from a flight into the lovely state of Georgia! One bite was all it took to know that all of my effort, my personalized recipe, the notes I had captured to write a blog post, for you, about how to make the perfect homemade pizza was a total waste. After eating a piece of pie from Varasano’s, mine will never stack up! ….. errr with the exception of cost! Would you be interested in making your own pizza from scratch? Then take advice from Varasano. Here is his pizza recipe! If you happen to be in Atlanta, it is worth the stop. It is a clean and modern joint on the ground floor of a large apartment building. Free parking is in the rear and the service was very good. Though I was a little disappointed that Varasano was not willing to share a little starter dough with me, I’ll still go back given the opportunity. Readers: Does anyone know how to bypass the oven cleaning lock-out? 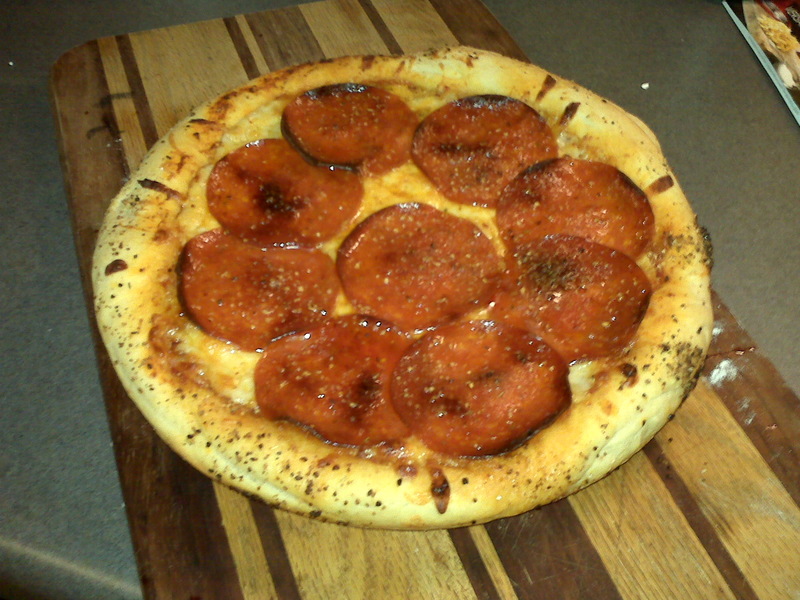 I love making my own Pizza but am far far from perfecting it yet… Your pic looks awesome, is that yours or his? Anyway, I am going to read his recipe and may jump on making some Pizza tonight or tomorrow. I’m not sure where you live, but we have some outrageously good pizza joints here in Northern New Jersey (and I’m NOT talking chain pizzerias). It’s probably because of all the Italians in our area. =) Nothing I make at home can compare with a pie from one of our local pizzerias. Of course, it depends on your tastes — dough thickness, sauce seasonings, etc. .-= RainyDaySaver´s last blog ..Joining a Gym: Investing in My Health =-. You know, my home made pizza is so good that I pretty much don’t like ordering it out or eating anyone else’s pizza anymore. I’m turning into a complete snob. Plus we get dinner for 2 for 2 euros AND it goes great with wine. What else is there? Well, yeah, when we finally settle down and buy a place, I intend to construct a good wood-burning oven outside–they do that quite often here in France. Yum! @Forest – The picture is of one of mine. This was was cooked in my grandmothers cast iron skillet. You will know his when you see it! @RainyDay Saver – Virtually anything made from scratch with fresh ingredients is good to me. I have traveled in northern N.J. and I have had some great pies there. @Simple in France – I tried talking the wife into a pizza oven in the backyard. I have a feeling she will get a new car before I can ever get a pizza oven. Since her 12 year old car only has 65K on the odometer, it looks like it may be a long time before I get an oven! I am with RDS! Long Island here, and the pizza we have is AMAZING. That being said, I have visited my wife’s family in PA and jebus that pizza is HORRIBLE. The Wife calls me a pizza snob. I have been experimenting with making my own, because it is a quick, easy dinner to make. I use Trader Joe’s pizza dough which you just have to flatten out. Any experience with it or do you always make your own? .-= Evan´s last blog ..Don’t Forget to File your State Income Tax Extension =-. Now all ya gotta do is throw some pineapples on it! My wife has been making bread from scratch for years-we (she) even grind our own wheat. I have to get a post together about that! I am going to try out my Big Green Egg to make a crust with her recipe soon. will let you know-you can get it to high temps!!! .-= Dr Dean´s last blog ..Roth vs Traditional IRA’s: A Video Discussion =-. @Even – I did buy dough at the store once but ever since I’ve been making my own. Just tried another batch based loosely on Varasanos approach. I also cooked it at 550 degrees for 6 minutes. That is as hot as our stove goes until I can figure out how to rig it! @Ryan – Actually my son like mandarin oranges… go figure? @Dr. – Big Green Egg! You are now a new best friend. I have been dying to go splurge on a big green egg but I just can’t pull the trigger. Well it looks awesome :), I need to buy some Mozz cheese today.